Congress has lots of ideas for spending money. How about focusing on the debt? 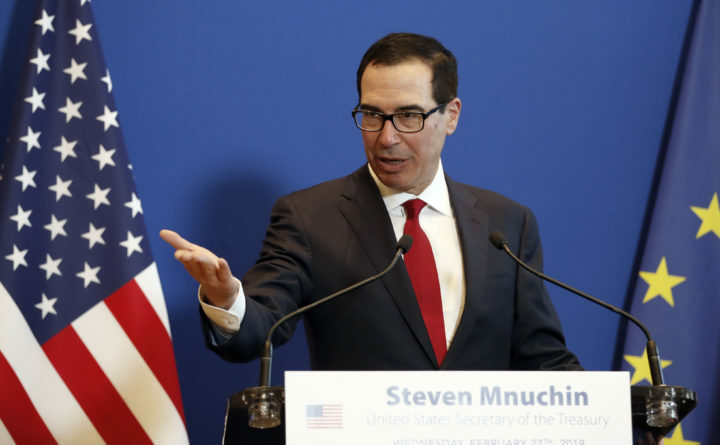 U.S. Treasury Secretary Steven Mnuchin speaks during a news conference with France's Economy Minister Bruno Le Maire after a meeting in Paris, Feb. 27, 2019. Whether it is the Green New Deal or a wall along the nation’s southern border, the 2020 presidential race is already teeming with expansive policy proposals and politicians seeking to differentiate themselves from the pack. If there is one theme that unites these proposals, it’s the expense. It’s not easy to excite voters with promises to cut programs, conserve money, or increase taxes. During the dark days of the financial recession a decade ago, a group of lawmakers came together with a shared interest in government financial reform. The bipartisan CPA and Accountants Caucus was formed to advance commonsense principles such as setting a budget and sticking to it. The timing was no coincidence, with billions of dollars in economic recovery money flowing out of public treasuries. Four years passed before the accounting group disbanded out of a lack of continued interest. The newly elected House leadership, including Pelosi, designated reforming PAYGO as one of the most important items on their agenda. PAYGO is a commonsense system of budgeting which allows Congress to approve spending only if it already has the funds. It’s like relying on cash, rather than a credit card. PAYGO needs expert input from a group like the former Congressional CPA Caucus to keep everyone on track. Budgeting and running the numbers is what accountants do. With at least eight CPA’s currently serving in Congress, members need to once again convene this group of experts to help reform PAYGO and ensure the government’s books are accounted for correctly and to avoid the looming sequestration. Sheila Weinberg, CPA, is the founder and chief executive officer of Truth in Accounting, a nonprofit organization based in Chicago that researches government financial data.